Let’s get swimming at East Side Athletic! I am looking forward to seeing you at the Get In & Swim Smooth Squad Sessions at East Side Athletic Club, 9100 SE Sunnyside Rd., Clackamas, OR 97015. The swims are Mondays and Fridays at 6 am. Request to join the Closed Facebook Get In & Swim East Side Athletic Club 6AM Squad to be included in swim announcements, posted workout boards and to ask and listen to any questions that come up. The group can be seen in FB, but none of the posts are shown so use this space as your own! Let me know if you prefer an email digest and I will do my best to send it to you. Your $100 monthly payment is due anytime in the week prior to the start of the month as it reserves your place. You may also pay in person at your first swim, but do let me know that you are intending to sign-up, well in advance. Payments are as cash, check (payable to Get In & Swim) or via Paypal to getinandswim@gmail.com. Anyone needing to swim on only Mondays or Fridays during a month may pay for a split month for $55. 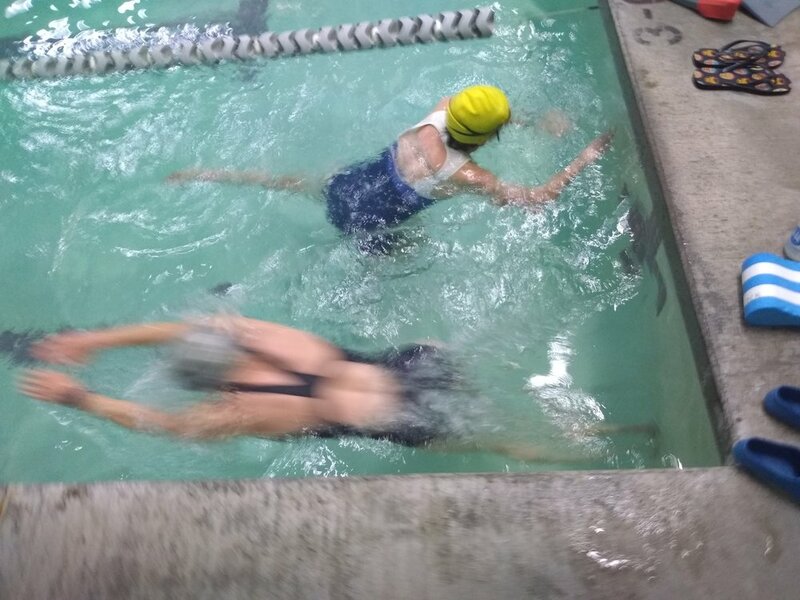 There is also an option for monthly swimmers to swim a particular missed session with the Parkrose Squads, but you’ll need to provide the $4 pool fee at sign in. The session coaching will be free of charge. For the East Side sessions, you'll need your fins (bring floppy floating long ones if you have them as I want you to focus on the drill not the kicking), and pull buoys, and if you have them, your hand paddles, non-fixed-to-the-hand types are preferred. I will have a few of the different types that Finis makes which I like for you to try as well. Bring your Finis Tempo Trainer, if you have one, but don't worry, as I'll have one for each lane. You can find this suggested equipment in the Get In & Swim Store. Lastly, don't forget a water bottle, as the pool and air temps are on the warmer side hovering at 85F. The Monday Technique Endurance Sessions are half technique and half learning how to pace at your own threshold/Critical Swim Speed(CSS)/mile pace. At the CSS Development Sessions on Fridays we will work on threshold or Critical Swim Speed (CSS) pace more fully. The aerobic threshold/CSS portion of both swims will be based on your own current individual threshold pace based on a 100 average time for a theoretic 1500/1650 m/yd distance swim. Your individual tempo or lane tempo is set via the Tempo Trainer metronome to beep per 25, ideally timed as your feet hit the wall. I can roughly estimate this for you to get you started, or you can complete the Critical Swim Speed Test as a workout on your own for best accuracy. Please send me an email if you would like that workout! Many swimmers enjoy having this as an official benchmark to starting the sessions and observing progress. Don’t worry about learning this new way of pacing yourself. You’ll quickly become a natural at knowing how to “stay with or beat” the beeper. Upon arrival at East Side Athletic Club, you’ll need to check in at the front desk and let them know that you are swimming the Get In & Swim Smooth Session. If it’s your first visit, you’ll need to register your name and contact info on the ESAC form. Do note on your form that you are swimming the Swim Smooth Endurance Squads if you prefer to not receive a call regarding membership. The pool at East Side is informally available starting at 5:45, and it's great to set you intention for arriving then to check in at the desk, set up your guest locker, weigh in to see how much water you need to replace after you're done (it's a hot box in the pool room), warm up in the hot tub or sauna, dry land stretch, review the workout, chat, shower before the swim (available poolside!) or do a few laps if you need/want additional distance. The workout will start promptly at 6 am and end with the regular East Side clients rushing in at 7 am. No lane space is available past 7 am. Feel free to bring your phone to capture an image of any of the workout boards that you'd like for your own personal use. Also to note is that the full club facilities are available to you post-swim. Feel free to head upstairs to bike, run or stretch post-workout and make some more new friends. As always, be in contact with anything, anytime. I am always happy to help.